The first optical mirrors were solid metal, beginning around 1668 (350 years ago). The first glass mirrors were solid, beginning around 1851 (167 years ago). Early on consistency & high Coefficient of Thermal Expansion (CTE) of the mirror material, low resolution of the optical tests and control of the optical surfaces did not allow for precision. Issues like thermal mass and internal temperature gradients were unknowns because the quality of the surface was by far the largest error in the system. This made it impossible to see other errors and the potential benefits of alternatives. This is an important fundamental. We don't recognize how poor something is until we compare it to something better. 100 years ago G.W. Ritchey, the renowned optician, designer and inventor, recognized that solid mirrors came with a lot of performance-robbing baggage. This led him to produce his own lightweight mirrors. No matter the substrate material maintaining as small a delta between the optic and the ambient temperature is one of the keys to performance, as is maintaining mechanical positions; optical alignment and optimal focus. Numerous independent studies have shown that mirror seeing degrades performance unless the mirrors are within +0.1°C to -0.2°C of ambient temperature. This range on paper may have little meaning but any engineer who understands thermal control and optics knows this window is very small and very difficult to achieve with high certainty. Saying we can pedal a bicycle to 100mph is the easy part. Actually doing it is rub. And by rub, we mean hospital visit. Visual cues of thermal issues disappear long before the small temperature window is achieved and therefore long before degradation stops. If exceedingly tight optical alignment and focus tolerances, as well as maintaining the mirrors within this small tolerance of the ambient temperature are not met, then claims of quality are just that; empty claims. Dream's zeroDELTA lightweight mirrors provide the foundation for the utmost in performance, across numerous factors. Click the image to the right to read a thermals white paper. Thermal Time Constant: Think about a 500 gallon container filled with water. Drill a 1/4" hole in the bottom of the container and let the water drain out. The 500 gallons of water represents the thermal mass of a solid mirror. The 1/4" hole represents the efficiency at which the mirror will equalize to a static temperature. As a comparative tool the Thermal Time Constant is the time it takes for the water to drain out; for the mirror to reach equilibrium. Dream's zeroDELTA lightweight mirrors typically start off with only 85-125 gallons of water and the hole in the container is 5" in diameter. Lower mass, thinner profiles and greater surface area are all contributing to the industry-leading performance of the zeroDELTA mirror. They can not only reach a static temperature far faster, but they are also highly nimble; able to rapidly react to dynamic temperature changes, creating the smallest performance losses possible. Download this TTC calculator to compare the zeroDELTA mirrors to either thicker, "lightweight" mirrors or solid mirrors, of any material type. A 1°C delta between an optic and the ambient temperature can produce a minimum of 0.3-0.5 arc-second of degradation. There are many features of Dream's zeroDELTA lightweight mirrors that make their thermal time constant substantially lower than solid mirrors. Solid mirrors have many negative side effects that are hurting the performance of the system. The less thought put into thermals related to the mirrors, the telescope, etc., the greater the chances that the solid mirror(s) are not reaching equilibrium at all. It may not be the site seeing that is limiting performance but the key component in the system; the mirror(s). 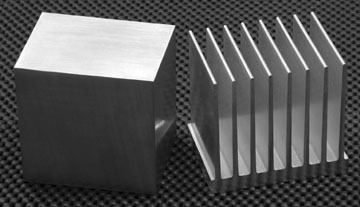 When answering the questions below for the aluminum block and finned aluminum piece shown to the left, the answers are common sense. The answers are the same for glass and glass-ceramic mirrors as well. * Which one has more surface area? * Which one will equalize to ambient temperatures faster? * Which one will stay closer to ambient temperatures, especially throughout it's bulk (internal)? * Which one provides greater total performance? Glass and glass-ceramic mirrors have undesirable performance in their thermal properties; heat capacity & thermal conductivity. They hold onto their existing bulk temperature and they do not conduct away that temperature readily. Dream's zeroDELTA engineered lightweight mirrors resolve both of these historic problems by starting off with 3-6 times less material, 4-6 times more surface area, while using profiles that are 10-25x thinner than solid mirrors. This deals with the problems directly, which G.W. Ritchey recognized 100 years ago. Figure distortion and mirror seeing don't require large temperature differences and/or larger diameter mirrors. It's wishful thinking to believe that solid mirrors, used in environements where the temperature changes, are performing at an optimal level, all of the time. Even inside a lab, temperatures are rarely controlled to +/-0.1°C, due to the real-world difficulty of actually achieving this small tolerance. The thermal properties of the material, the geometry of the solid mirror substrate and often the incapsulated nature of the mirror mount and back portion of the instrument are all lengthening the time it takes for the solid mirror to equalize. The use of a zero-expansion material does not change any of these facts because CTE has nothing to do with thermal time constant; how quickly a mirror equalizes. Use the TTC calculator to do your own research and learn the materials to a deeper level. How does the optician know what the real figure is if it is constantly changing? How can the work be done so rapidly if the solid glass mirror was not allowed to fully equalize? You can have one or the other but not both. 1+1=2. It can't equal L/20... Figure distortion in solid glass mirrors is the main reason glass-ceramics were created. But they only address one of the two thermal issues; figure distortion. They do not address thermals at the boundary layer; the most sensitive location in the system for thermals to occur. Not to mention solid mirrors', of all material types, issues with gravity and therefore mechanical performance in the instrument. The larger the mirror, the larger the thermal problems, which is why it was stated that some mirrors won't equalize. Taking three days to equalize after a cold front moves in is a lot of performance, time and discoveries lost forever. Dream's mirrors do not suffer the above thermal problems. The 396mm CA f1.376 mirror that Dream finished for an Adaptive Optics project equalized and showed steady test images within 30 seconds of being placed on the kinematic mirror mount for vertical testing of the mirror. The mirror could come off the polishing machine after 1-2 hours of work, be rinsed, dried, placed on the mirror mount for testing and show steady views/data, all within three minutes of coming off the machine. 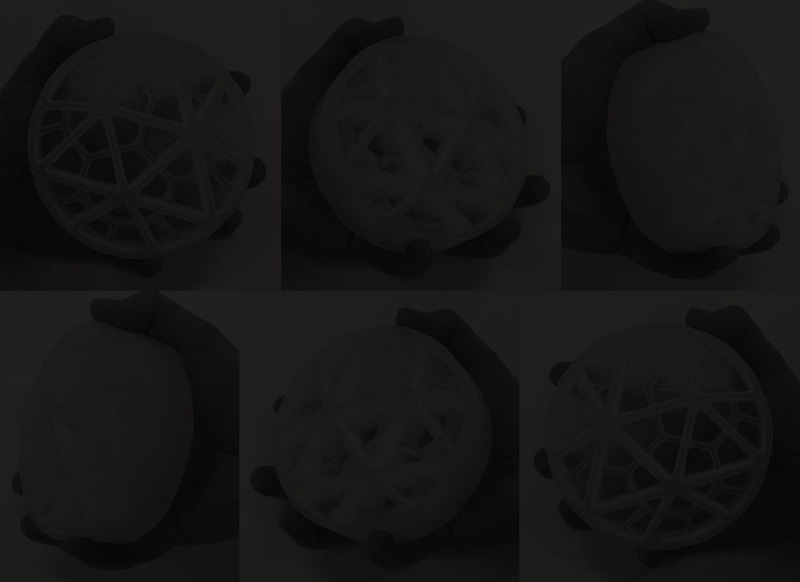 This is the enabling and disruptive nature of Dream's zeroDELTA mirror technology. 396mm CA f1.376 mirror was 16.6" physical OD, 2.5" edge height and weighed 9.5 pounds. 39 years in professional optics, using everything from million dollar test rooms to 144" Continuous Polishers.